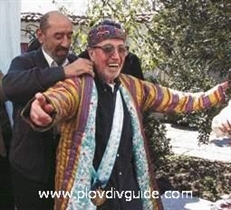 Plovdiv has recently lost one of its most eminent figures – Atanas Vassilev Krustev (17.09.1922 - 25.11.2003), whom each citizen of Plovdiv used to know by the nickname “Nacho the Culture”. He was born on September 17th, 1922, in the neighbouring town of Assenovgrad. In 1954 he started working for the Science, Art and Culture Department at the Plovdiv Municipality. That eminent citizen of Plovdiv was among the founders of the Ancient Plovdiv Administration, which opened in 1968. In the period 1969 – 1986 he was the Ancient Plovdiv Administration Director. In that fruitful period, he initiated and patronized the restoration of the most essential culture monuments of national and local significance in the Plovdiv’s Old Town. Houses were attributed to various cultural unions and associations (the Writers Association, the Journalists Association, the Teachers Association, etc), thus creating better conditions for working and socializing of the valuable cultural elite of the city. During that period the Zlatyu Boyadzhiev Museum and the Hristo G. Danov House Museum opened for visitors in the Old Town. Nacho the Culture was also the initiator of the annual National Autumn Exhibitions in the Old Town that started in 1970 , which still is a wonderful cultural tradition in our city. An impressive collection of valuable works of art had been gathered by the Ancient Plovdiv Administration. The authentic interiors of the imposing Old Town Revival period houses (the Nedkovich House, the Hindlian House, the Birdas House, and many more) got restored and opened for visitors during the time of his management. When I finished my service in the army I started looking for a job. I had no idea what I truly wanted to do. Then I accidently met Zhivko Belev, who invited me at his Science, Arts and Culture Department… That was just my chance. I stepped for the first time ever in the OldTown in January 1954. It was extremely cold and, to tell you the truth, I was not much impressed… If you ask me now how I fell in love with that place – I just don’t know… It was a kind of magic. The first thing the museum specialist Lyubomir Petkov showed me was the Red Room in the Nedkovich House. I dream of museum exhibitions by the greatest artists of Plovdiv right in the very beginning of the Old Town. So, you start walking up there and you first take a look at Zlatyu Boyadzhiev’s paintings, then Tsanko Lavrenov’s, then the City Gallery, and you can finally indulge in the world of Georgi Bozhilov-Slona. (In fact, Nacho managed to make that dream a reality). During the long lonely nights at the hospital, I started going back in my memories, recording them on cassettes. I also picked out photos from those days...My house is a real museum; I have preserved so many valuable memories in there. And my successor Yavor will surely keep it that way.